The “Mela Annurca IGP” is defined as "the queen of apples" especially for the quality of its fruits, the flesh crisp, compact, white, pleasantly tart and juicy, fine aroma and flavour, a true delight for the palate of consumers. This fine red fruit is characterised by the extremely smooth and waxy skin and, because of the weak and short stalk unable the fruit to support its weight on the tree, growers pick the apple before it’s ripe and, continue the ripening process on the “Melai”. 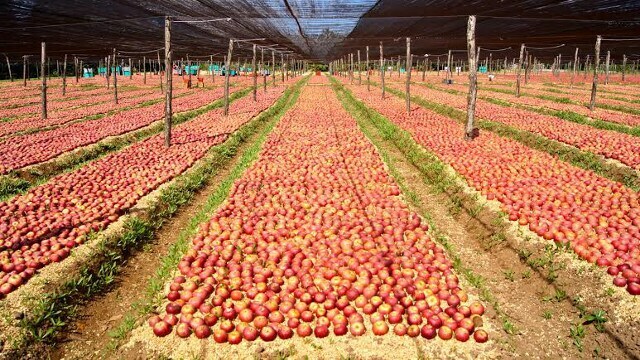 Basically, the “melai” is where the apples are lined down on a bed of wood chips and, turned periodically, until they have acquired their natural red color and, only then the produce can be transformed or sold on the market. The harvest is done during the month of October, is held on the “melai” for about two months, so roughly in mid-December the apples are ready for use and, they can be stored until the summer of the following year. The "Melannurca” is present in Campania from at least two thousand years. Its representation in the paintings found in the excavations of Herculaneum and in particular in the “Casa dei Cervi”, testifies to the ancient bond of the Annurca apple with the Roman world and the Campania Felix in particular. Recent studies have demonstrated that the annurca apple is rich in substances capable of giving it a high antioxidant power, which may have a decisive role in the prevention of cancer. The richness in the fibre then makes it particularly suitable to clean the arteries from cholesterol and therefore to prevent cardiovascular disease. The miraculous properties of Annurca apple make it attractive from a nutritional point of view, compared to other apples because of itsacidulousness also used in medicine. It is rich in vitamins (A, B1, B2, C, PP), minerals (calcium, iron, phosphorus, magnesium, potassium, sodium, sulfur), fructose and sucrose. Has low lipid content. Presents, in peel, a high concentration of cellulose that exalts the digestive properties, making gradual absorption of glucose (suitable for diabetics). Fights the gastric acidity and promotes the elimination of the uric acid. If eaten raw has an astringent, while eaten cooked has marked laxative properties thanks to the action of the fibres and the pectin contained in it. The pectin, reduces the absorption of cholesterol for which the consumption of apples is particularly recommended to those who suffer from hypercholesterolaemia. Thanks to the fibre content and oxalic acid, has bleaching properties and chewed long at the end of a meal, it is excellent for dental hygiene and for the prevention of caries, cleans teeth. It is recommended to eat the annurca apple together with the grated because in it is contained the most vitamins and fibre. It is used in gastronomy, combined with other ingredients offers tasty dishes from appetisers to desserts. In addition to very yummy cider, from the annurca apple is also distilling an excellent grappa and liqueur.